EDITOR’S NOTE: This travel guide to festivals in the Middle Atlantic States was written with British bluegrass fans in mind who might want a sidetrip to experience American bluegrass in a festival setting while visiting the cities in the NYC-Philly-D.C. corridor. It is not inclusive. There are a plethora of other fine festivals in the region. We looked for larger festivals with artists with names that a fan from across the pond would recognize. I often get asked how it was I came to be the British Bluegrass Music Association’s “man over there,” as Dave Teague likes to refer to me. It all started with a trio to visit my daughter, who spent a year at Kingston University earning her masters degree. As we planned our trip, I told my wife I wanted more from a visit to England than Big Ben and Buckingham Palace. Sure, I wanted to see all the popular tourist sites, but that could be accomplished with a day on a hop on-hop off bus pass. Queries on the BBMA’s Facebook page led us to a two-hour drive in the country to the village of Catsfield, where we were treated to an intimate little show by The Ben Somers String Band. It was an amazing experience. The music was top notch. We ate the best meal of our trip before the show at The White Hart pub in Catsfield, where we met other bluegrass fans. And we got to experience your country and your culture in a way we’d never have discovered through a book from Lonely Planet or Fedors. Since then, I have had an opportunity to return the favor a few times, responding to e-mail inquiries from travelers from your side of the pond seeking information and tips about experiencing bluegrass in the U.S. In particular, a number of those requests have been for information about attending American bluegrass festivals. That in turn led to this little travel guide to festivals in the region known as the Mid-Atlantic states. An overhead view of the Allegany County Fairgrounds during DelFest from atop the bluff on the West Virginia side of the Potomac River. There are great festivals all over the U.S., but we’ll concentrate in the Mid-Atlantic region because of its proximity to some of the more popular travel destinations on the East Coast – New York, Philadelphia, and Washington, D.C. Any of these festivals would provide you an opportunity not unlike what we sought on that trip to Kingston – a chance to escape the city and experience a genuine slice of American Pie. Aside from the fact that even the smaller U.S. festivals tend to draw much bigger crowds than the typical U.K. festival, they are not all that dissimilar to your festivals. On both sides of the pond, festivals offer an opportunity to see, and hear, a number of acts in one location. Both also offer the joy of gathering with fellow seekers of that high, lonesome sound. “There are differences, but thinking of what is good about festivals here that is missing there doesn’t bring any huge obvious glaring things to mind, aside from the location,” says Jeff Scroggins, who along with his band, Colorado, has toured the U.K. and played festivals there, and will be an instructor at this year’s Sore Fingers. “Festivals are bigger (in the U.S.). More people attend. It’s also warmer here,” adds Lisa Kay Howard-Hughes, who has played festivals in the U.K. with Valerie Smith and Liberty Pike and with East of Monroe. Aside from that, the biggest difference both noticed was there tends to be a lot more opportunities for pickers to jam at U.S. festivals. “There are more small jams and more diverse jamming here,” says Howard-Hughes. Where jams at U.K. festivals tend to be scheduled, more organized affairs, usually held in a designated tent or location, jams at U.S. festivals tend to be spread throughout the festival grounds and often are more impromptu gatherings. Jamming goes on throughout the day in the camping areas at U.S. festivals. At night, pickers tend to gather around campfires, drawn in by the music the way moths are drawn to a flame. Campfire jams are epic at many U.S. festivals. Tales abound of big name artists wandering into the camping areas to jam with the fans who came to see them perform. Scroggins explains the difference this way: “In the U.K, the campers are set up for sleeping in, but they lack the ‘circle the wagons’ mentality that is so common (in the U.S.). Here, people choose their camping location carefully and set up their camps in a way that creates a protected area and is very conducive to jamming. While camping at a festival can seem challenging for an international traveler, places to rent recreational vehicles (RVs, as we call them, or as you might say, “caravans”) to travel about the country, with almost all festivals offering RV camping areas. Many festivals also make it easy by offering “glamping” options that include fully equipped RVs (or “caravans”, as you call them) or tent options that include spacious tents, with bedding and sometimes even cooking gear, already set up on site and awaiting your arrival. For those desiring a little more comfort, many also offer hotel accommodations nearby. Some also offer shuttle bus service from area hotels to the festival grounds. Sure, attending a festival in the U.S. requires a little more planning than a trip spent taking guided tours of all the famous landmarks. But your effort will be rewarded with great music, friendly people, and a genuine chance to experience “real” America. 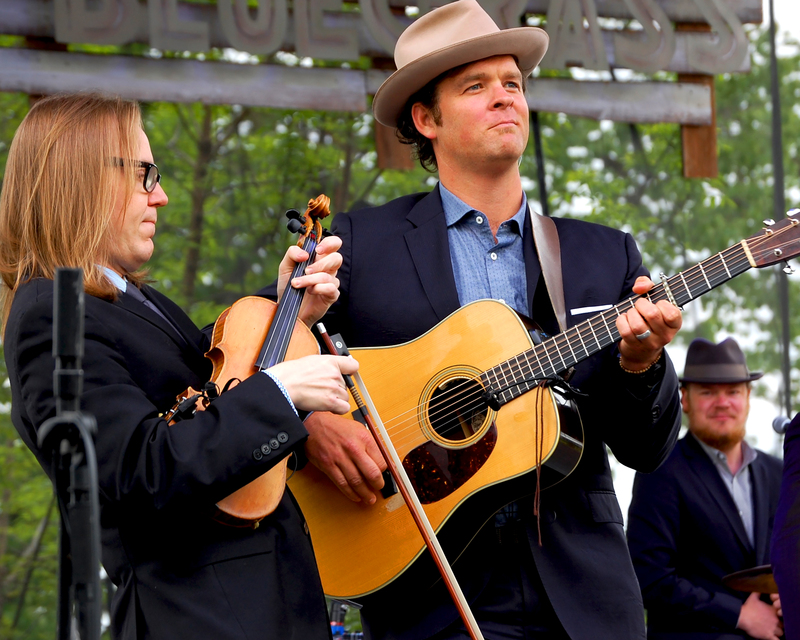 Steep Canyon Rangers will appear at both the Charm City and the Gettysburg bluegrass festivals. This might be the easiest option for international travelers since it is actually held in a major city. Baltimore, Maryland, a city with a long, illustrious bluegrass music history, is located on the east coast of the U.S., between Washington and Philadelphia. It might be the easiest festival for international travelers to get to. Baltimore. Non-stop, direct flights are available on several airlines, including British Airways, Finnair, Iberia, and American Airlines between Heathrow and Baltimore Washington International Airport (BWI). Baltimore is also served by Amtrak, the U.S. national passenger rail system, easy to get to from any other major east coast city between Boston and Washington. The festival is held in Druid Hill Park, a 745 acre oasis of nature in the northwestern part of the city. Though surrounded by urban development, you’ll forget you are in the city when you walk through the festival gates. One of the best things about this festival is that it has two stages, situated side by side at the bottom of a glassy slope that makes for a natural amphitheater. The proximity of the two stages means the music is almost continuous with no need for fans to make a trek from one stage to the other. Originated in 2014, Charm City expanded last year to a two-day event. There are also affiliated late night shows at the 8X10, an intimate live music venue located near Baltimore’s popular Inner Harbor area. The lineup is heavily bluegrass, with a combination of traditional and more progressive acts. Typically there is also a sprinkling of “Americana” bands in the mix, too. This year’s lineup features The Steep Canyon Rangers, Seldom Scene, Frank Solivan & Dirty Kitchen, Front country, Fireside Collective, Town Mountain, and more, including a special tribute to John Hartford with the Jeff Austin Band and special guests performing Hartford’s Aereo-Plain album. Charm City does not offer camping, but hotel accommodations are plentiful in Baltimore. This is also one festival where jamming is a little more limited due to the lack of a camping area, though a fair number of pickers tend to gather off in a corner of the festival grounds. Fans at the Gettysburg Bluegrass Festival claim their spots for the weekend by setting up their chairs early. If you are more of a traditional bluegrass purist, this might be the festival for you. The Steep Canyon Rangers are back again this May as one of the headliners, but that is about as progressive as Gettysburg gets. Other bands set to grace the festival’s single stage in May include Grammy winner, and Queen of Bluegrass Rhonda Vincent, with her band The Rage, Blue Highway, Special Consensus, Seldom Scene. Dry Branch Fire Squad, Po’ Ramblin’ Boys, and Mile Twelve. Gettysburg also holds a second festival each year in August. The festival, one of the oldest in the States, is held just outside of the town of Gettysburg, a site steeped in history as the locale of one of the most significant battles of the American Civil War. Camping is available on site, including a limited number of rental cabins. There are also plentiful hotel options. One distinguishing feature of the Gettysburg festivals is that there is no standing/dancing area in front of the stage. Fans set up a lawn chair when they arrive and can leave it to hold their spot throughout the four-day festival. Another nice feature is that they allow fans to bring their own food and beverages, which is significantly less expensive than having to buy your beer or meals from onsite vendors. You can even purchase six packs of beer at a very reasonable price from the little on site campground store. Although Gettysburg does not have a commercial airport and is not served directly by train, it is not a difficult place to get to. It is an easy drive from major east coast cities should you opt to rent a car. Another option would be to take a train to Harrisburg (there is daily service from New York, Philadelphia, Baltimore and Washington D.C) and then take a bus, or rental car for the 45 minute trip to Gettysburg. 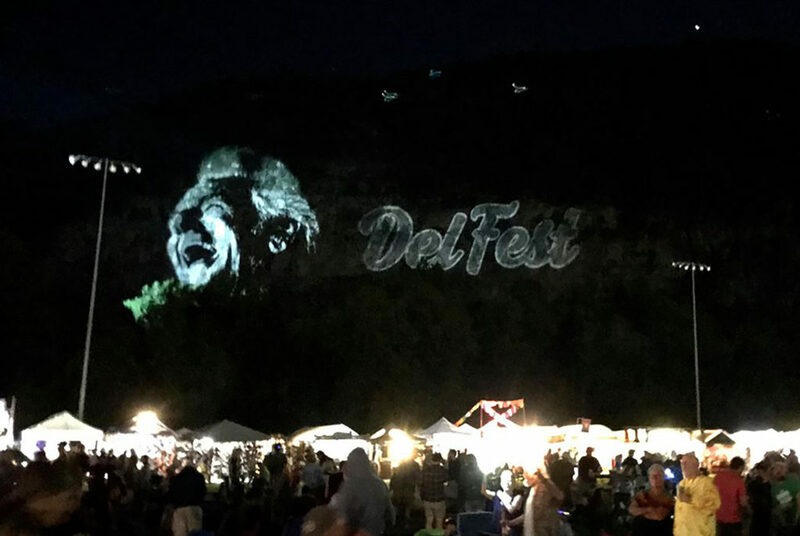 High powered lights project Del McCoury’s profile on the cliffs across the Potomac River in West Virginia during DelFest. 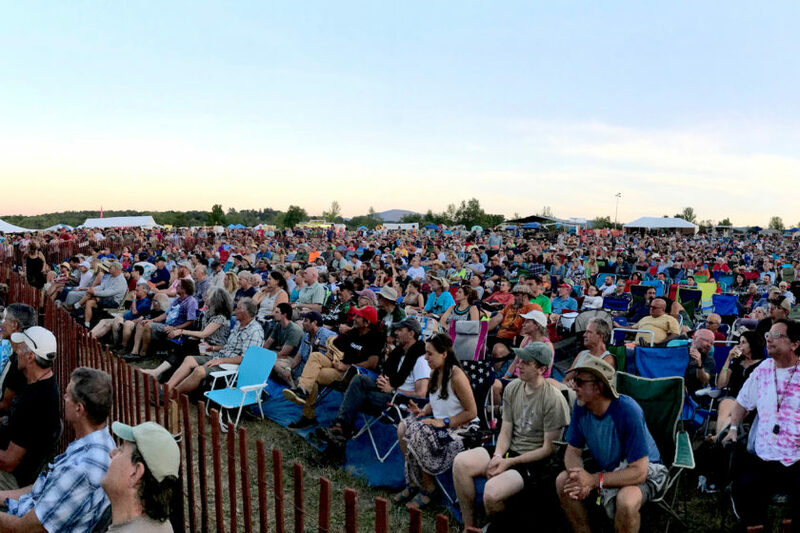 Hosted by bluegrass legend Del McCoury, DelFest is one of the bigger festivals around. Held each year on the weekend prior to the U.S. Memorial Day holiday, several thousand fans converge on the bank of the Potomac River, turning the Allegany County Fairgrounds into a small city populated by pickers and music lovers alike. Each year the lineup features multiple performances by McCoury, a former member of Bill Monroe’s Bluegrass Boys, and by 2019 Grammy winners for Best Bluegrass Album, The Travelin’ McCourys. Led by Del’s sons Ronnie (mandolin) and Rob (banjo), The Travelin’ McCourys are actually Del’s backup band, minus Del, who is replaced on guitar by Cody Kilby, a former National Flat Pick Guitar Champion who won four Grammys with Ricky Skaggs and Kentucky Thunder before leaving Skaggs’ outfit in 2015 to join the Travelins. Bass player Alan Bartram and fiddler Jason Carter round out the lineup, making them the only band that has had each of its members recognized as International Bluegrass Music Association (IBMA) award winners for their instruments. There are those who would argue a lineup of The Del McCoury Band, The Travelin’ McCourys, and five random dudes playing kazoos would be worth the price of a ticket, but DelFest’s lineup is always stacked with lots more great bands over the course of its four-day schedule. The full lineup was not fleshed out as this story went to press, but the first wave announced in January also included Sierra Hull, young guitar sensation Billy Strings, The Gibson Brothers, speedgrassers Trampled By Turtles, and I’m With Her. DelFest’s always eclectic lineup will also include The String Cheese Incident and Railroad Earth. Because of the event’s proximity to the Baltimore-Washington area, a number of other acts are always added in second and third wave lineup announcements that come later due to those acts have contractual restrictions that don’t allow them to announce shows within a certain radius until they play previously scheduled concerts in the vicinity. 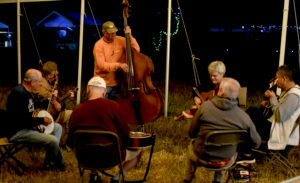 In addition to campfire jams throughout the festival grounds, pickers might also want to consider arriving a few days early to attend the DelFest Academy, held the Sunday through Wednesday immediately prior to the festival. The Academy offers instruction by an all-star cast of pickers, including the members of the Travelin’ McCourys. Another favorite part of the Academy is Bluegrass Karaoke, where students get to perform with the instructors as their backup band. The annual Band Scramble places Academy attendees in randomly selected bands to compete for a chance to perform on the main Grandstand Stage the opening night of the festival. You can find travel information, and information about camping and glamping options on the festival’s web site. It is also worth noting that there is shuttle bus service available to and from many area hotels. Like Gettysburg, it is easy to drive to Cumberland from most places on the east coast should you opt to rent a car. There is also Amtrak and bus service to Cumberland. You’ll find more travel info on the festival’s web site. Grey Fox Bluegrass Festival — Oak Hill, N.Y.
Grey Fox is on par with DelFest. 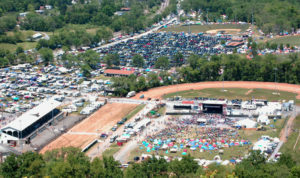 It is one of the bigger festivals around, though a limit of 4,000 camping tickets and the lack of other close by accommodations keeps the crowd size a little smaller than DelFest. One of the nice features of Grey Fox is that they have three stages and most bands play two sets. That allows you to catch at least one set of bands you like if a scheduling conflict makes you choose between two favorites in another time slot. That is if you even bother to see any of the bands appearing. This is another festival with a lot of jamming. Some folks even claim they are so busy picking in the campgrounds that they hardly bother to make their way to one of the stages. The initial lineup is a Who’s Who of Bluegrass, with The Earls of Leiscester, The Tim O’Brien Band, Del McCoury, The Travelin’ McCourys, Frank Solivan and Dirty Kitchen. Tommy Emmanuel, and more. 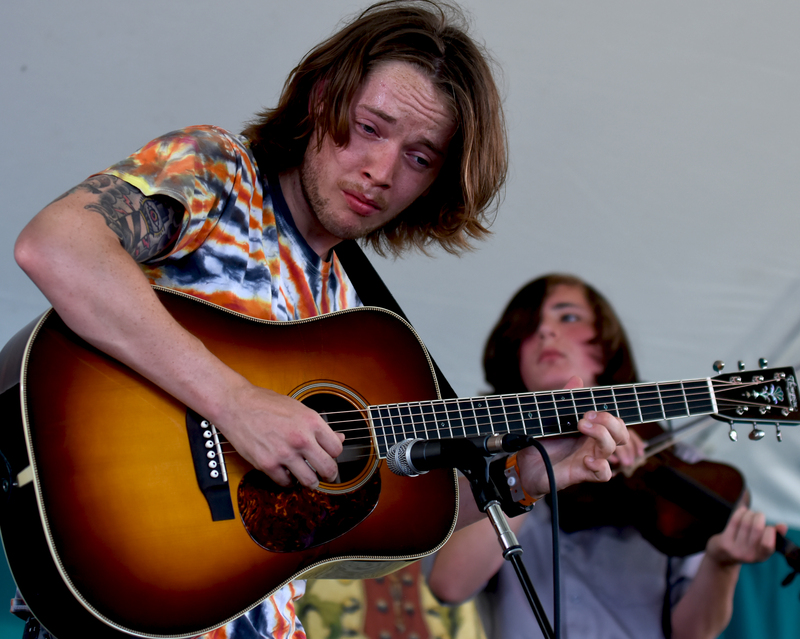 Again this year, hot young flatpicker Billy Strings will be an “artist in residence,” meaning he will be sitting in with lots of other acts in addition to playing a set or two with his own band. Held in the Catskill Mountains of New York state, near Albany, this one is a little more of a challenge to get to. There is train service to a nearby town about 45 minutes away. Festival organizers estimate a cab from the train to the festival would cost around $40 (USD). There are not a lot of hotel accommodations in the area, but they do offer a nice glamping package with a variety of glamping options. 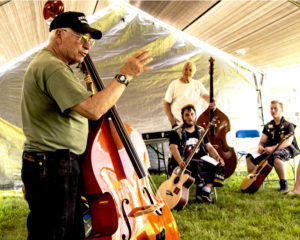 Delaware Valley Bluegrass Festival — Woodstown, N.J.
Now in its 48th year, the Delaware Valley Bluegrass Festival was founded by Ralph Stanley and Bill Monroe. You don’t get much better pedigree than that. Located about 35 miles from Philadelphia, on the traditional U.S. end of summer Labor Day holiday weekend, Del Val’s lineup this year will include Ricky Skaggs and Kentucky Thunder, The Travelin’ McCourys, Balsam Range, the Gibson Brothers, Danny Paisley and Southern Grass, Special Consensus, Darin and Brooke Aldridge. Transportation wise, your best bet would be to rent a car. There is public transportation to Woodstown, but it takes a combination of local buses and or trolleys and even then one would need an Uber from Woodstown to the fairgrounds. Accommodations wise, camping is included in your festival ticket, but there are no glamping options. There are several hotels nearby, including some that offer special rates for festival goers. you can find a list on the festivals web site. On any given weekend during “festival season” (roughly April through September), you can find a festival within driving distance of major northeast U.S. cities. Many are smaller, with lineups that feature fewer big name acts, but still top quality bluegrass. 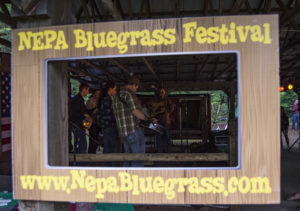 NEPA Bluegrass Festival — Tunkhannock, Pa.
Held in a beautiful creekside park in Pennsylvania’s “Endless Mountains” region near Scranton, NEPA’s 2019 lineup will include Ralph Stanley II and Jeff Scroggins and Colorado, along with a number of top regional bands. Free camping. No glamping, but there are hotels nearby. Smoked Country Jam — Cross Forks, Pa.
Also in Pennsylvania’s Endless Mountains region, this one is more remote, located about an hour’s drive north from the nearest major highway. But that hour is spent on a beautiful scenic route winding along the West Branch of the Susquehanna River and the venue is just as beautiful. Billed as a “Roots to Branches” festival. The lineup includes traditional and progressive bluegrass and lots of good workshops. 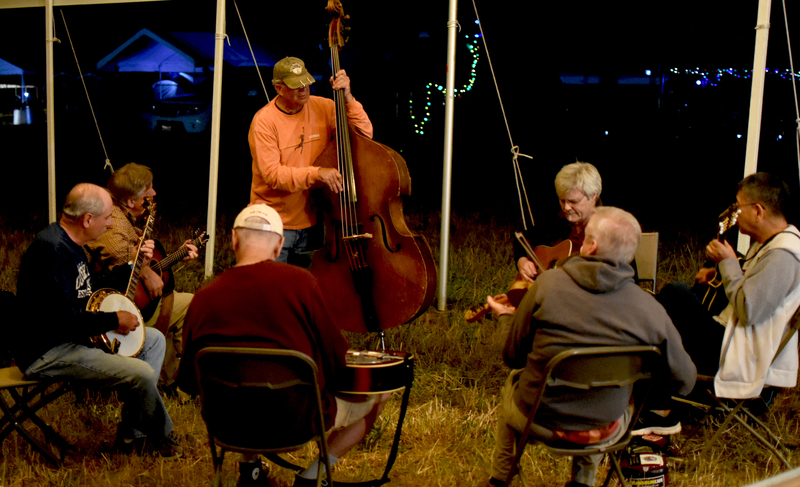 This is another pickers festival, where many folks spend as much time jamming in the camping area as they do at the festival’s two stages. Headliners this year include Songs From the Road Band and Fireside Collective, two hot, relatively new bands from the bluegrass hotbed of Ashville, N.C. who you can expect to be hearing a lot more about in coming years, and a number of other bands who were invited to play showcases at last year’s IBMA gathering. You can find lots of other festivals by searching the internet. A good place to start is by checking the schedules of some of your favorite bands. You’ll also find a good list here — http://www.bluegrasstrail.com/index.html.